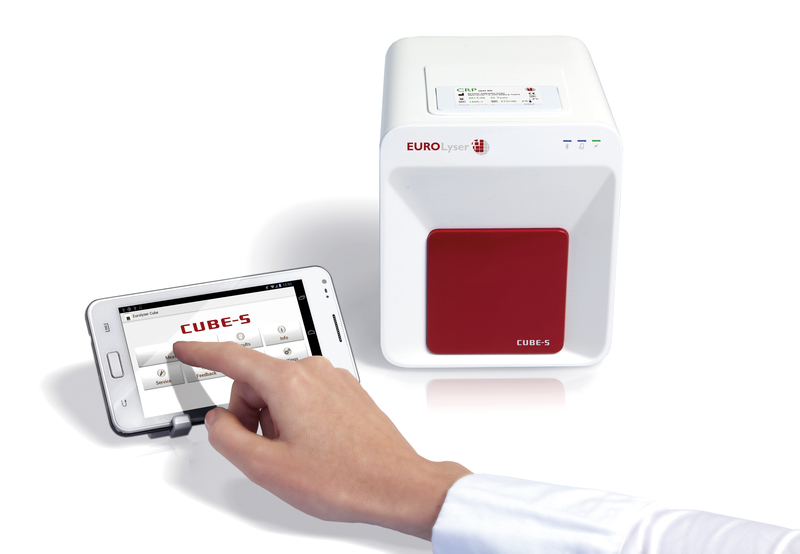 The Eurolyser CUBE is incredibly small, but its performance easily measures up to modern, large laboratory systems. Operated through the tailor made Android app, this instrument is the perfect solution for laboratories, physicians and patients expecting nothing less than the best. 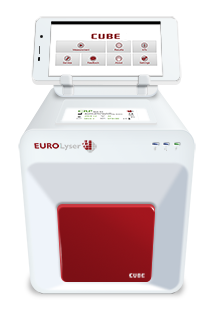 The Eurolyser CUBE is the answer to many of today’s health issues. Its genius technology generates precise results in a very short time. In addition the instrument provides a transparent progression of the patient’s health status due to the integration into modern eHealth systems. What are the first steps I need to take after receiving my instrument? Please do NOT throw away any packaging material, most importantly: the tablet cardboard inlay needs to be included in the box to prevent transport damages in case of a return shipment. Pull the protection foil off the CUBE or instrument’s door and store it in the box. Before processing the first test, the transport protection needs to be removed and stored with the packaging. What type of regular maintenance does the CUBE instrument require? The CUBE instrument has been designed to be maintenance-free – it does not require any regular maintenance. The instrument is calibrated at the factory and has an internal self-check procedure during every measurement to ensure that it is functioning properly. The calibration curve, the expiry date or the cut-off value for each test is encoded on the RFID card provided with each test kit. The CUBE has embedded software and new versions are released for free when new features (such as new user information, new tests, new languages) or functionality improvements are added. If you like to use the new features, all you need to do is updating the CUBE app. The procedure is just as simple as updating any app on an Android phone: go online and press “update”. If you intend to continue using the CUBE instrument as is and do not need new features, there is no need to update the software. New software updates are automatically pushed on to your CUBE tablet PC as soon as you are online (e.g. connected to a wireless network). Just follow the instructions on the display. The exterior of the instrument and tablet PC can be cleaned using lint-free cloth dampened with water. A mild detergent may be used if necessary. No liquid should be allowed to run onto the edges of the display, the measurement well, or the connectors. Do not use organic solvents or corrosive substances. Spillages of potentially infectious material should be wiped off immediately with absorbent paper tissue and the contaminated areas swabbed with a standard disinfectant or 70% ethylalcohol. Materials used to clean spills, including gloves, should be disposed of as biohazardous waste. How often do I need to quality check the system? 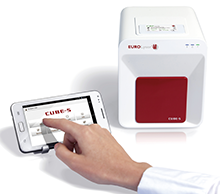 The CUBE, being a point-of-care system, uses single-use reagents. Therefore all Rilibäk requirements (Part B1 of the “Richtlinie der Bundesärztekammer”) are met. As a result, the instrument is exempt from the obligation to perform a round robin test and internal measurements are to be performed once a week. the age distribution will be -specifically in developed western industrial countries – changing dramatically. In the year 2040 30% of the population will be older than 60 years. chronical diseases are increasing due to a general lack of exercise and wrong nutrition. due to the increase of our life expectancy and the number of elderly people an increase in multimorbidity is inevitable. the cost pressure on the health care system is increasing continuously. The benefits of the healthcare system can be achieved more effectively and cost-efficient due to the availability of medical data, the prevention of repetitive analysis, optimized treatment concepts on chronical diseases, improved medicine security and the indentation of ambulant and stationary medical treatments. “Move the information to the patient” – Patients shall get treatments as near to their residence as possible. Location-independent supply – telemedicine allows patients in remote regions to get the optimal medical care. Efficient delivery of medical treatments – unnecessary administrative work as well as repetitive analysis is avoided. Security and confidentiality – every exchange of information must comply with the latest standards in data security towards an individual patient. 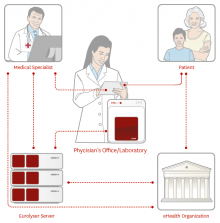 Easy access to medical information – easier accessible for employees within the healthcare system as well as patients. 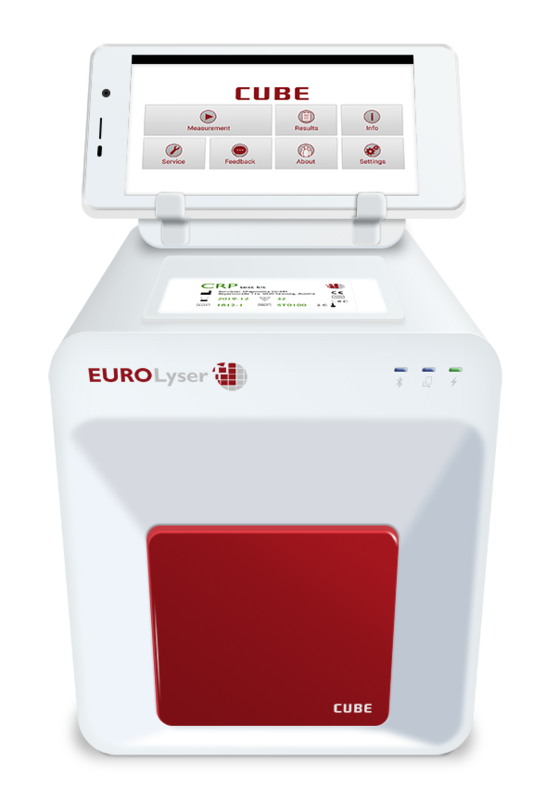 The Eurolyser CUBE is ideally suited for connecting to modern eHealth (or mHealth) services due to its internet and network capable android application on the tablet PC.